The science is there. Everything in the universe is energy vibrating at similar (or very different) speeds. This includes everything around us, both man and nature-made. It includes our bodies and even our thoughts. Your thoughts are electromagnetic realities. MAGNETIC. That means, the more you think a certain thing, the more likely you are to have it in your life. I created a gratitude jar in January. I put at least one note of gratitude in there every day, often it’s 2 or more notes a day lately. Reminding myself of things to be thankful for seems to allow me to observe more things to be thankful for. I have found that, the more blessings I see in the world, the more easy-going I keep my thoughts, the happy hits just keep on coming! It’s a very cool concept once you THINK about it. 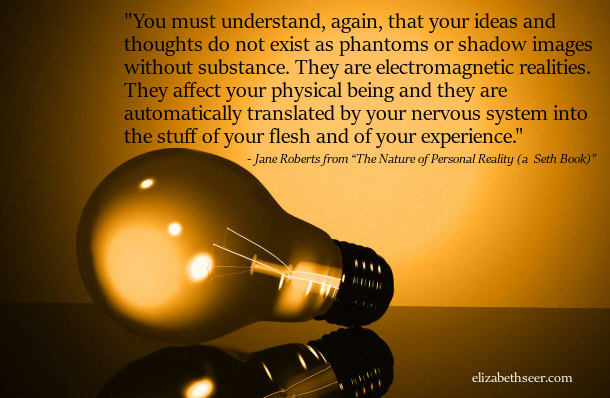 Jane Roberts knew this as she channeled this information in the 1970’s from a faster-vibrating energy called Seth. check your thoughts, electromagnetic thought, manifest, mindful thoughts, positive thoughts, though reality, thought energy. Bookmark.